Oakhill School grew from an idea sown in the early 1990s by pioneering parents who wanted a good education for their children. They sought to establish a school which expressed “joy in learning” and placed the child at the centre of an integrated curriculum. With educationalist Allan Graham at the helm, teachers’ countrywide applied for posts and accepted appointments with no guarantees, save the dedication and enthusiasm of the headmaster and founding parents. The new school’s 54 students, ranging in age from six to sixteen, spent the first term of 1992 in a unit of the newly opened Woodmill Lane Mall. In April that year the school moved to its permanent location on the hillside above Knysna, sheltered by oaks and with a view of the lagoon. The dream was realised. Allan Graham laid the foundation – with no formal uniform, no prefect system, and strangely compared to today, very little sport. He used his relationship with the IEB to advise Bridgehouse, Somerset, and Principia on opening sister schools, moving himself to head Bridgehouse. Gary Norton, ex- Marist Brothers College, had a short reign, as did Colin Winchester. Hilton Stander stabilized the school as numbers grew close to 350. Hilton constructed eight new classrooms and effected modernization of facilities. 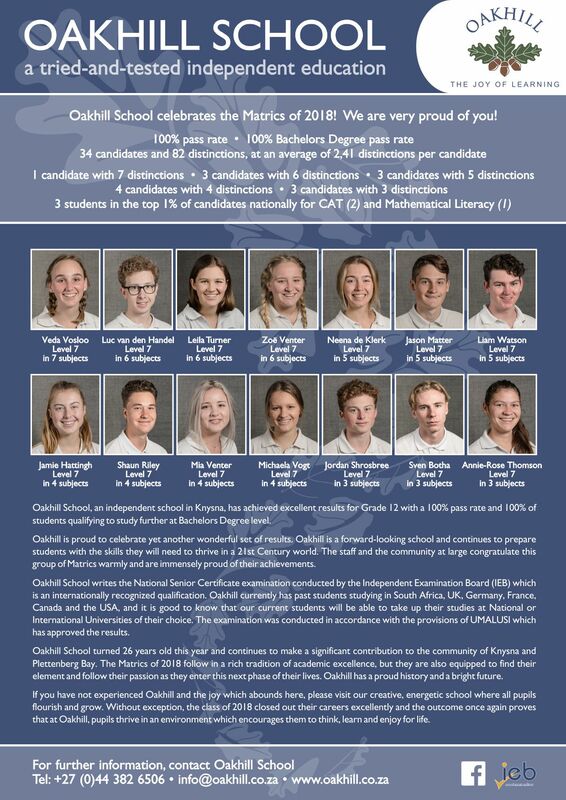 Today Oakhill has more than 500 pupils from Grade 000 to Grade 12 and is growing steadily in reputation and numbers, attracting children from local areas and from further afield. College students follow the Independent Examinations Board (IEB) syllabus which maintains international university entrance standards and is the benchmark for the highest education qualifications in South Africa. Excellent academic results and glowing appraisals from external assessors confirm Oakhill’s progress. The School is continually improving its facilities – from the classroom to the sports fields. The Information Technology Centres are constantly upgrading computer equipment and software to provide students with the necessary technological skills. The school’s growth has accelerated the need for double-streaming and plans are being made to build new classrooms to accommodate the increasing numbers of children. It is inevitable when excellence across the curriculum is achieved, a school will grow. Oakhill is prepared for this growth, growth in all senses – mind, heart and body. 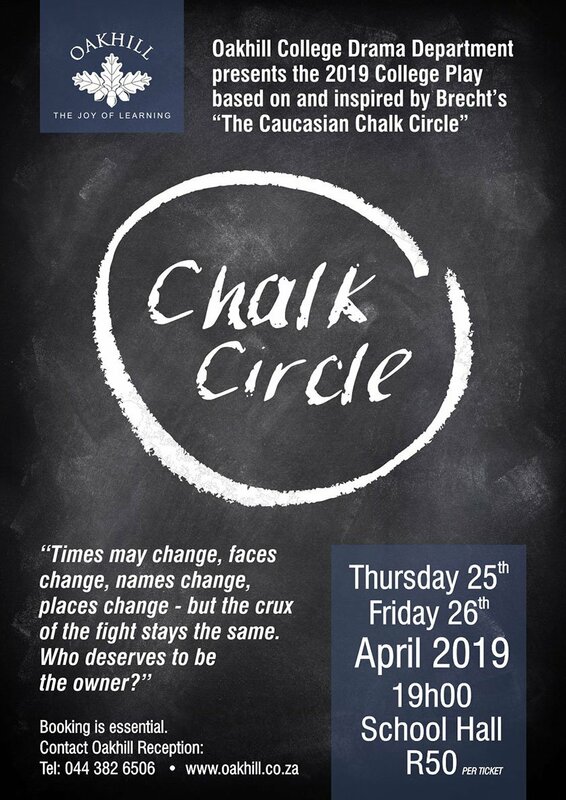 It is a demanding school, expecting dedication and excellence from staff, commitment and involvement from parents and the realisation of their potential from pupils. At the start of 2009, Shane Kidwell, Deputy Head of St Alban’s in Pretoria, took over the leadership to initiate a growth era for Oakhill, with its development of the Oakhill Sports Campus and the Learning Commons Block. Shane returned to St Alban’s, as Headmaster, at the end of 2016. Oakhill now enters an exciting new chapter with Head of School, Jannie de Villiers, who joined at the start of 2017. Loudly and proudly calling, singing the truth. High as the spirit of our new Knysna youth.